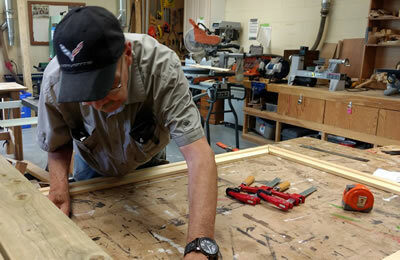 If you have an interest in working with wood, visit our Seniors Woodshop. It is a very well equipped shop, manned by qualified instructors and it can be yours for building, repairing, wood carving and producing sawdust for the sheer joy of it. The shop is equipped with a table saw, band saw, router table, drum sander, belt sander, drill press, thickness planer, compound miter saw, three lathes as well as a selection of hand tools for “old school” carpentry. We even have the capability to drill square holes. All members of the Aurora Seniors Association are welcome to use the shop. It is open and supervised Monday through Friday from 9:00am to noon and from 1:00pm to 4:00pm. Special training classes will be held as needed.